archconnection has no other items for sale. 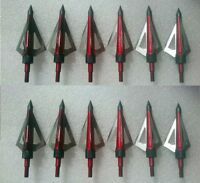 EXCALIBUR BOLTCUTTER CROSSBOW BROADHEADS REP BLD 18/PK. Overall Bow Length (in. ): 35.5"
The shipping will be added to the bid price. We will ship anywhere in the United States or worldwide as reflected by shipping prices listed in the auction. The shipping price only applies to the US or countries listed please contact us for shipping price if you do not see your area or country listed. The product will be shipped upon receipt of payment. Received this Crossbow with high hopes, 100% easy assembly 15-20 minutes tops(I highly recommend using blue thread lock)The 4x32 scope was 10” low out of the box, after turning dial all the way out it was still 5-6” low. I made some curved shims and added them to the rear end of the scope bracket, now it’s dead on at 20-30-40-50yds. CAUTION: This bow has some tremendous energy behind it, the string stops and few dampeners that come with it are good but I HIGHLY Recommend getting additional limb dampeners to help with the noise. All in All this is a great Crossbow and it’s extremely fast and hits like a Amtrak train. The only draw back that I do not like is that the scope does not have a dusk illumination. Other than that I have been pretty impressed so far that being said. I have only had the bow for a a free weeks and I haven’t put it through it’s full paces yet. 90 shots so far and no fraying. easy to assemble. had it sighted in at 20 yards in about 20 minutes. 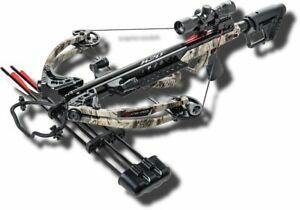 great starter bow for me at a very affordable price.very fast bow. a little noisy but i normally shoot a compound bow. have not shot it past 20 yards yet. looking forward to shooting at longer distances. recommend buying lots of bolts i ruined all three sets of fletchings during the sighting in process due to extreme penetration depth in the targets. Researched many different brands and features. Being my first crossbow purchase, I had many concerns and questions. This crossbow was the answer! Assembled very easily. The crossbow is short and compact. Easy to load a bolt, even at it's high 175lb rating. I added a Tactacam 2.0 HD camera to the crossbow using an underscope mount. Best accessory for many reasons. **Shoots very fast and very straight! However, it did require modifying the back mount of the scope. 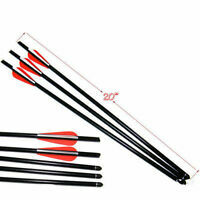 Out of the box the bow shot consistently 6 inches low at 10 yards (less than 1 inch patterns). I found the same condition described by others online. I placed small strips of rubber tape in the back scope mount, under the scope. This corrected the need to adjust about 120 clicks up. That much adjustment exceeded the ability to replace the elevation cap on the scope. Definitely a 5-Star crossbow in my book. I absolutely love this crossbow. I bought a different scope for it, but other than that it is great. No need to spend a thousand dollars on a crossbow when this one is made so well. The string dampener could be a little better to make it more silent, but it's not Some thing that can't be lived with. Highly recommend purchasing this crossbow if you're in the market but don't want to spend a fortune.